"Contamination of sediments in Boston Harbor, particularly by metals, is so widespread that its effects may be felt long after the sources of contamination are shut off. Where are toxic concentrations of metals located today? How did they get there? How will they move? These are questions that must be answered in detail before we can properly estimate risk in the environment." Ample data exist to complete a comprehensive toxicity analysis of Boston Harbor sediments, but until recently these data have not been integrated. Scientists at the U.S. Geological Survey (USGS) have assembled a significant body of data that is now in a usable form. The USGS adopted an interdisciplinary approach to begin the pioneering effort at data rescue. This work involved collaboration with the Environmental Protection Agency (EPA), the U.S. Army Corps of Engineers (USACE), the Massachusetts Water Resources Authority (MWRA), Massachusetts Coastal Zone Management, and the National Oceanic and Atmospheric Administration (NOAA). More than 100,000 sediment chemistry analyses from over 1,500 samples were gleaned from 500 references, compiled, and scientifically edited by the USGS and other workers for use in studies of the distribution and fate of contaminants. 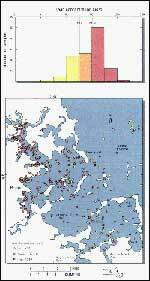 USGS studies have documented toxic levels of metal contaminants in Boston Harbor sediments. At least 50 percent of the surface sediment samples taken from Boston Harbor have concentrations that exceed NOAA's lowest effects-based toxicity thresholds for 6 of the 14 metals having sufficient analyses. Mercury (Hg) is potentially the most serious contaminant since nearly all the surface samples in the harbor have concentrations higher than NOAA's screening threshold. Lead (Pb) concentrations also exceed minimum threshold levels, but the contamination is neither as widespread nor as severe. Contamination may not be restricted to surface layers, but virtually all sediment layers near the top have much higher concentration levels of all metals than do the deeper, pre-industrial layers. Toxicity criteria for sediments are not well established and must be used with caution. Toxicity criteria are determined by exposing biota to varying levels of contaminants in sediments and comparing responses. However, unpolluted sediments can occasionally have metal (nickel and chromium, for example) concentrations greater than or equal to the lowest recommended toxicity thresholds. Adverse effects in organisms may also depend on factors other than concentrations. USGS database and mapping efforts help establish natural variations in background levels of potentially toxic metals and organic contaminants, as well as sediment properties, so that each area under investigation can be considered on its own geochemical terms. Contaminants are not distributed randomly, but follow patterns that are consistent with sedimentary environments. USGS work has provided details of the areal distribution of contaminants and their concentrations in harbor sediments. A critical factor in understanding how contaminants move and where they ultimately come to rest is knowledge of the sedimentary environments, such as areas of erosion and deposition, and the type of sediment that contaminants are usually associated with. Cores taken in the harbor and Massachusetts Bay provide an important historical record of sediment contamination levels in the marine environment. They also reveal the thickness of contaminated layers. A key issue facing environmental scientists, planners, and regulators is the mobility of contaminants in the sediments. After contaminants are deposited on the sea floor, biological and mechanical mixing of the top few centimeters takes place. Normal biological activity of worms, clams and fish affects the top few centimeters of sediment almost everywhere, although pollutant-tolerant biota replace others where sufficient contamination exists. In some areas, worms may burrow as deep as 30 cm, mixing shallow sediments with more deeply buried sediments. Other episodic changes are created by harbor channel dredging, waste dumping, storm-wave action, trawling, and dredge material disposal. The effects on near-surface sediments are often unpredictable; however, remobilization of sediments in these and other ways can bring contaminants that are associated with sediments back into the water column. These processes affect the rate at which contaminants will be removed from the ecosystem. 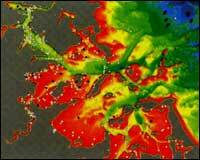 USGS studies focus on determining the extent to which Boston Harbor is a net depositional environment. Many important questions face environmental scientists: how much of the contaminated sediment remains in the harbor and how much moves out into Massachusetts Bay and beyond? Of the material that remains, how much becomes buried deep enough by natural sedimentation to remove it from serious concern and how much is resuspended or transported elsewhere in the harbor? Should some areas of the harbor be considered hazardous and if so, how are they changing with time? Answers to these questions will help determine how long this problem will be with us. A National Contaminated-Sediments Database is in early stages of development. The Boston Harbor data form the basis for an in-depth study of contaminated sediments in one area. The National Estuaries Program has identified many fragile environments for further study. USGS scientists have initiated collaborative efforts with EPA, USACE, National Science Foundation, NOAA, a number of universities, and local and State government agencies to assemble, edit, and validate relevant sediment and contaminant data that already exist. Specific projects are underway for Chesapeake Bay, Gulf of Maine, Long Island Sound, and Gulf of Mexico. The necessary data exist so that studies similar to the one in Boston Harbor can be successfully completed, but first the data need to be identified and incorporated into a National Contaminated-Sediments Database.